It's Wednesday, and here’s another soup recipe! These quick all-in-one-pot recipes are my favorite because dishes are not my favorite thing to do. 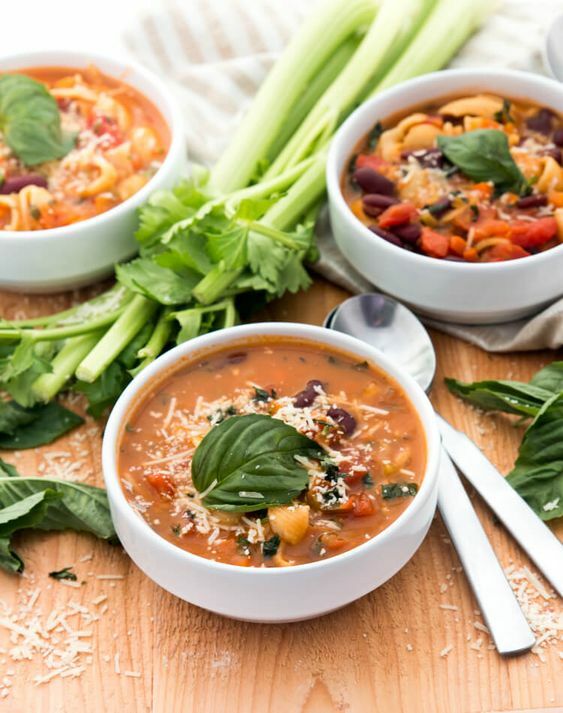 This minestrone is not only a one pot meal, but also a hearty, healthy and filling one, too. Since this soup has some canned ingredients, let’s talk a little about BPA (bisphenol A). You should definitely look for Organic and BPA-Free cans when buying canned food. Why do you want to avoid BPA? The short answer: it is a chemical which can disrupt your hormones. According to a study by Scientific American, BPA is also linked to the obesity epidemic in children. How scary is that? We as parents should just take action and protect our children and ourselves from this chemical. Heat up 3 Tablespoons olive oil in a soup pot. Add in chopped onion, then sauté for 2 minutes. Add in chopped celery and carrot, then sauté for another 2 minutes. Add in minced garlic, 1/4 teaspoon oregano, 1/4 teaspoon basil, a teaspoon salt, and 1/2 teaspoon black pepper. Give your soup a good stir. Add in organic diced tomatoes. Add 6 cups vegetable broth, then bring to a boil. Add 1 cup of pasta in, then cook until the pasta is fully cooked, about 10 minutes. Add in organic kidney beans. Bring to a boil, salt to taste if needed, and turn off heat. Garnish with parmesan cheese (optional) and fresh chopped basil.